Northumberland is a magical county. Empty beaches, huge skies, pretty seaside towns and, much to the delight of Ted our rescue mongrel, dogs are allowed on the beaches all year round. This is Walkworth beach in mid August- crowded isn’t it?! 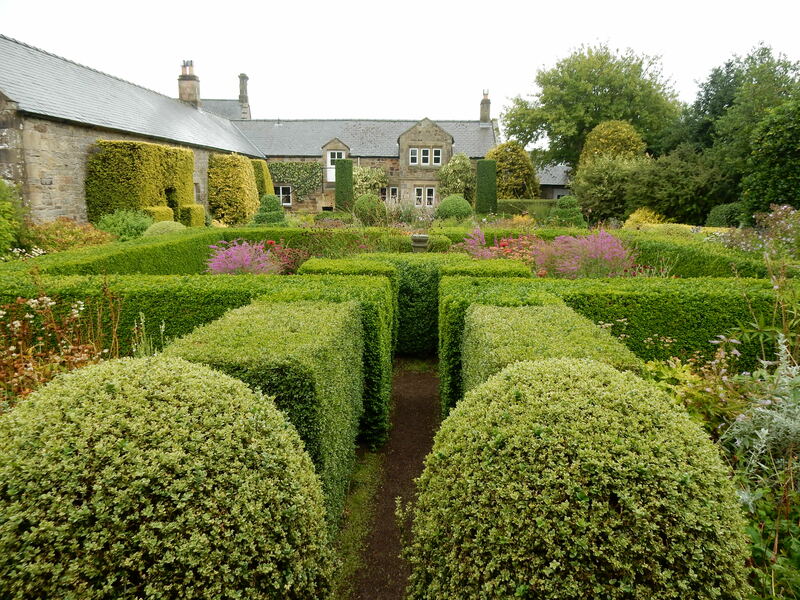 For a couple of years now I’ve been meaning to visit a rather out-of-the-way garden called Herterton House in the remote Northumberland hamlet of Cambo. I’ve been entranced by photos of this unique garden,even more so after buying the book written by its creators Frank and Marjorie Lawley ( Herterton House and A New Country Garden) describing how they’ve lovingly created it from a bare site leased from the National Trust over a period of nearly 50 years, and on very limited funds. And then, last year, on our way to take Ted on his annual beach holiday ( he is one lucky mongrel) we went two hours out of our way to visit Herterton only to find it had closed the day before! So this year, I made sure we made the trip early enough as I knew the owners were getting quite elderly ( possibly in their eighties?) so time might be running out for both them and me! We arrived after a very long detour into deepest Northumberland in pouring rain to find the gate closed and bolted! I couldn’t believe it- this was the second year running that I was too late! I stood there under my red umbrella praying for a miracle and got one! We were ushered into The Shed where we paid our £5 and Frank told us about the garden. ” We have made 4 separate areas here:a winter garden, flower garden, knot garden, and more recently the Fancy Garden. ” said Frank. ” and just out there is the plant nursery”. I could see no potted plants but Frank explained that if you like a plant he would dig up a clump of it, pack soil around the roots, wrap it in newspaper, bind in clingfilm and leave it ready for you to take away. Quirky and old fashioned, as if from another era where time is slowed- just like this garden. We left Frank and ventured out to explore. He had already explained the division of labour- he plants and maintains the hedges, topiary shapes and shrubs, whilst his wife Marjorie fills in with a tapestry of colour. The devoted pair love both colour and tapestries, and actually spend winter evenings either making tapestries , planning tapestry planting schemes or sorting seeds in their beautiful Arts and Crafts inspired interior. What I love most about this garden is the use of shrubs and the mix of leaf colours- not just greens, but variegated and yellows too. The Tower looks out onto surrounding countryside. Inside there is a display of the intricate drawings made by Marjorie showing the position of every plant in the garden- they are works of art in themselves. The photos also show the wreck that they took on as impoverished art teachers, determined to live a simpler life and to create beauty in this place. Every rock, house brick and plant has been placed by them, although they still lease the land from the National Trust. Their isolation means their influences have been few but vital: ” We once visited Sissinghurst about 50 years ago. It was very fine.” said Frank gravely. So you can see the strong structure of the garden provided by hedges of yew and box with infill plantings woven in a myriad of colours throughout. Details that I’d like to copy were everywhere. I love the buttresses that somehow settle the house into the garden. I love the way the doors are framed. I love the way the ivy is clipped into controlled neatness. I love the pairs of topiary features, the symmetry anchoring the herbaceous planting. I love the simple arbours- frames made from evergreen shrubs. We made our way back to the shed to pick up our chosen plant ( a Persicaria affinis ‘Donald Lowndes’) neatly wrapped in newspaper. A reminder of this unique garden, a relic from a bygone way of life combining simplicity, slowness and excellence. Frank admitted that he and Marjorie were getting on in years and the future was uncertain for them. I do hope that the National Trust provide horticultural help soon to allow both the Lawleys and their garden to keep going for many years to come- both it and they are gems and need to be preserved. This was my first and possibly last visit to Herterton- I’m so glad I made it this time. It’s lovely Anne. Wish your class could go. Weekend?? Your blogs and photos brighten the toughest of weeks. Keep them coming. Delightful!